Cape Cod is in the midst of an unprecedented sea turtle stranding season. This media release pertains to the transport of turtles by the US Coast Guard. See more pictures of sea turtle rescue season in our Animal Care Facility on the Rescue Blog. To disperse a seeming tidal wave of stranded sea turtles washing up on Cape Cod, the New England Aquarium arranged for 243 re-warmed Kemp’s Ridley and green sea turtles to be flown to Florida and North Carolina Tuesday. A rescued Kemp's ridley sea turtle in treatment at the Aquarium's Animal Care Center in Quincy, Mass. Before dawn, 193 critically endangered Kemp’s ridley sea turtles were netted from the pools of the Aquarium’s sea turtle hospital in Quincy, MA, loaded into padded boxes and transported to Otis Air National Guard Base on Cape Cod where a Coast Guard plane transported the 3-10 pound, black shelled turtles to Orlando where they were distributed to seven marine animal rehab facilities in north and central Florida. At mid-morning, 50 Kemp’s and green sea turtles were also pulled and driven to suburban Norwood Airport where a private pilot flew them to North Carolina for distribution to the aquariums there. These turtles will spend at least a couple of months in the various rehab settings before being released back into the ocean. 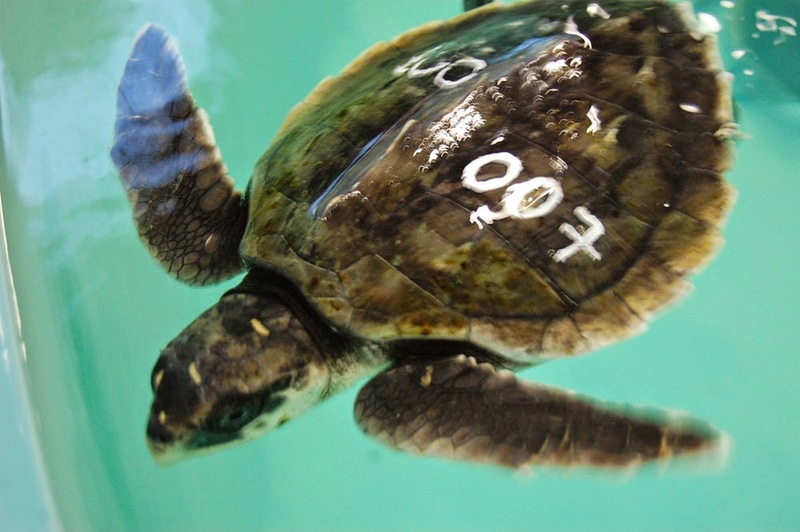 The flights temporarily freed up critical tank space at the Aquarium’s hospital for more turtles that have been rescued and have been waiting at the Massachusetts Audubon Sanctuary at Wellfleet Bay. Within two hours of the second flight departing Massachusetts, 50 more sea turtles were transferred to the sea turtle hospital from the Outer Cape nature center. The turtles remaining at the Audubon sanctuary have been under the care of an Aquarium veterinarian on site. After a week of nearly a hundred turtles washing up daily, Tuesday’s mild weather gave rescuers a break as just a few live animals were found. Here's a quick look at a rescued sea turtle's journey to the Aquarium's Animal Care Center. Only three weeks into the eight week long sea turtle stranding season, 2014 has already smashed prior records into oblivion. 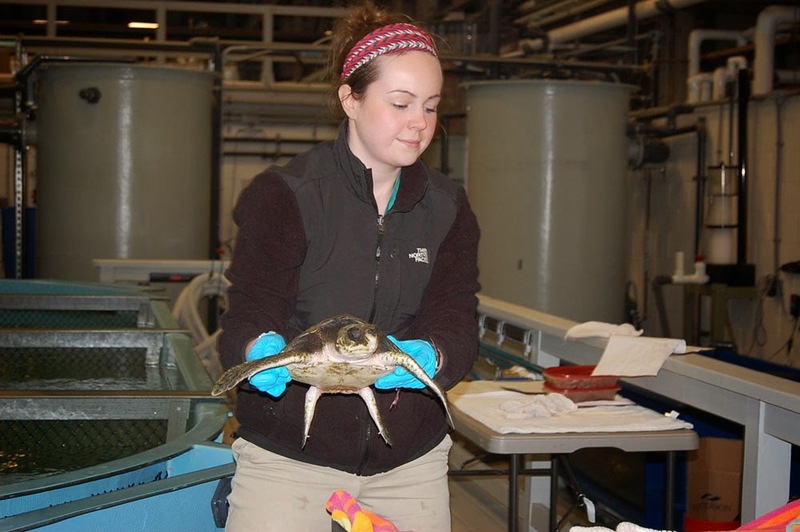 Since November 3, Mass Audubon had recovered 976 live and dead sea turtles. Just over 600 of those turtles arrived alive. Including today’s flights, 328 turtles have been re-warmed, stabilized and transported to rehab facilities in Georgia, North and South Carolina, Florida, Pennsylvania and Massachusetts. 180 turtles are in residence at the Quincy sea turtle hospital as of Tuesday night and about 100 turtles remain in Wellfleet. The previous record for live turtles treated during a season was 242, and the average over the past decade was about 90! There are 4-5 weeks remaining in the stranding season, and regional sea turtle biologists are in disbelief and amazement at the number of cold-stunned juvenile sea turtles that have been recovered and possibly remain in Cape Cod Bay. The operational challenges have been immense for both the Aquarium and Mass Audubon, but the outpouring of support and help from trained volunteers to other marine rehab organizations to NOAA has been tremendous. This historic and daunting stranding event has a possible silver lining. If these endangered turtles did not strand, they would die, but also the unprecedented number is a probable indicator that high percentages of the hatchling classes over the last two to five years have survived, and that should aid in the slow recovery of the most endangered sea turtle population in the world.